There are certain photos that you are only going to capture from an aircraft. And the helicopter is an extremely flexible aircraft platform to shoot from. 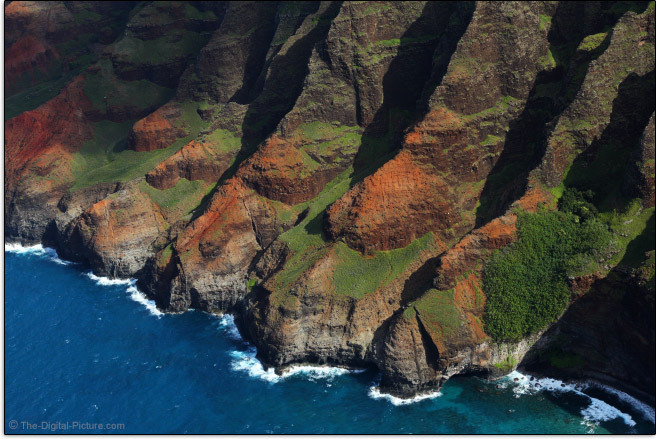 Fresh off of a helicopter photography charter on the Na Pali Coast of Kauai, Hawaii, I'd like to share some helicopter photography tips with you. After deciding that you need to be in the air, you need to select who is going to take you up. Which helicopter charter or tour company are you going to use? While some locales have little selection in who flies you, I was fortunate to have many options in Kauai. To narrow down my selection, I was asking several questions. A priority question was: What type of window seat can be guaranteed? For photography, you want a window seat. But not all "window seat"s are created equally. If you fly with a general helicopter sight-seeing tour, you may not end up with a window seat - even if you have been told that you will have one. When boarding, the operator will likely use body weights to place clients in the helicopter - for a balanced load. Even if you get a guaranteed window seat flight, you may not be able to shoot from that seat. The center front seat in some helicopters is low and has controls intruding upon the seating space. Shooting from this position would be tough. Will the operator reschedule your flight if conditions are not good for photography? Most operators will not want to fly if the weather is bad, but ... there can be a gray area between what is bad for flying and what is bad for photography (lack of sunlight being perhaps the biggest issue). Be sure that your flight operator will reschedule your flight if the weather is not favorable for photography. 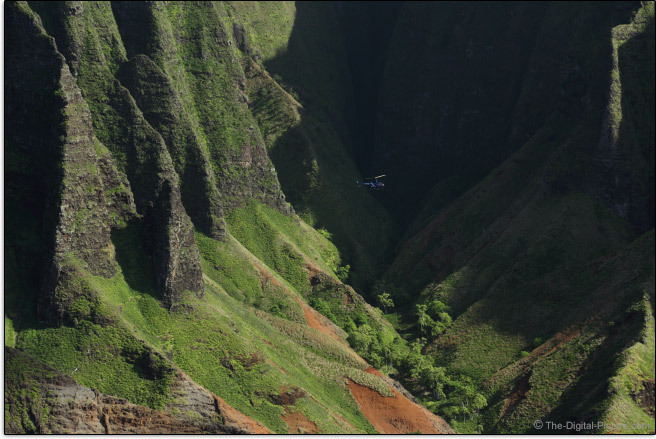 Kauai's Mount Wai'ale'ale receives, on average, over 460" (1,168cm) of rain per year. Basically, it is always raining there - but not necessarily everywhere around those highest peaks. And some clouds are desired in landscape photos. Still, I wanted to be able to reschedule around weather that was ideal for my needs. Tip: Book your flight early in your trip so that rescheduling can be accommodated. If not enough clients book a specific flight, some operators will cancel that flight. Find out your operator's policy before signing up. I booked a flight that was guaranteed to fly (with weather remaining a contingency). Again, booking early in your stay can allow for rescheduling. If you are flying to shoot something specific, make sure your flight is going to give you the time you need with that intended subject. Some tours only fly the standard script. If one pass is all you need for your subject, the standard tours will probably be more cost effective. I needed many passes on the sea cliffs I was primarily "focused" on - no standard tour would have catered to my need. Doors on or doors off? You can shoot through the expansive, mostly-glass helicopter doors, but ... you will lose contrast in your images. And reflections will be a problem. Be sure to wear dark clothes if shooting through glass to reduce your own reflections. Better optically is to shoot from a doors-off flight. Some companies encourage doors off flying while others want doors on and closed at all times. One big name tour operator quoted me $750 to take the doors off (and wanted $2,200 per hour to fly a private charter). I was later told that the model helicopter they were flying requires the doors to simply be locked open. Basically, they did not want to vary from their scripted tour flights. I don't have a problem with that practice - but that was not the right tour company for me. Most tour companies open to flying with the doors off will advertise this. And I recommend flying doors off for many people and situations - especially for photo flights. Flying with the doors off from a window seat gives you a clear view of your subjects - as long as you are on the correct side of the helicopter. But flying with the doors off introduces many issues - primarily because of wind. I'm not talking about just a little wind - I'm talking extreme wind. There was so much wind on my flight that I could barely press my back into the back seat I was in. There can be nothing loose on the doors-off flights for risk of the loose item blowing into the tail rotor. This also includes camera gear. You are typically permitted to take just the bare camera (I took two) on a neck strap - with no lens hood. Any loose fitting clothes (such as hoods) are going to to be highly irritating if not painful. You will not keep a baseball-style hat on. Dress warmly. Ask the operator for more specifics on this recommendation, but I wore a winter jacket and jeans with air temps on the ground in the upper 70s (f). You will likely be given a headset for communication with the pilot and other passengers. The headset has a cord and a mic boom. The wind will then blow your camera strap off of your head and tangle it with those headset accessories. Even holding onto the camera requires a strong grip. 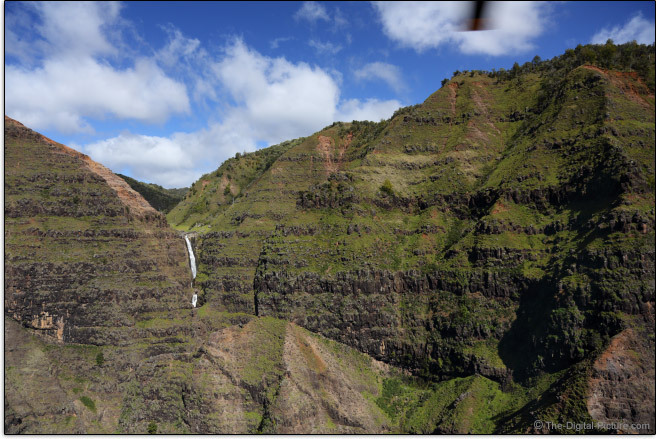 For my charter, I selected the "Photography Flight" with Mauna Loa Helicopters (tell them I sent you). Their 4-passenger (including the pilot) Robinson R44 Raven II helicopters are ideal for photography. The rate (per person) was not significantly different from a standard tour rate, but the pilot was able to cater to my needs and desires. Ad hoc requests were not a problem as the pilot was free to go where I wanted (within airspace permissions). My flight duration was also flexible. I was able to shoot until I was confident that I had captured what I wanted. We had a target time limit to the flight, but finished about 10 minutes early. I was given the ideal seat for photography. I actually straddled the two back seats (within the tight seat belt's limits) and shot from both sides of the helicopter at times. While most good pilots able to follow instructions can do a good job for you, Mauna Loa has pilots experienced in flying serious photographers. This experience is of course helpful. Shown below is one of Mauna Loa's Robinson R44 Raven II helicopters navigating the "Front Door". The massive sea cliffs dwarf the helicopter. With the wind, vibrations and motion, you are going to need a fast shutter speed to capture sharp images - even with image stabilization - when shooting from a door's off helicopter. Prior to the flight, I was recommended minimum shutter speeds ranging from 1/500 through 1/1000. I made 1/500 work at times, but at other times, 1/1000 was not fast enough. Longer focal lengths need faster shutter speeds - as you would expect. Huddling behind the pilot's seat (pilot had his door on) is a very good idea as there is a little relief from the wind there. Still, accurate framing is not easy. Frame slightly wide so that cropping and straightening can be done later. If you want your images to have an extra pop - to look like more than a snapshot - you probably need to use a circular polarizer filter. Of course, CP filters reduce the amount of light reaching your sensor. This means that the fast shutter speed is going to require a wider aperture and higher ISO setting. Depending on how far you are from the subject and the focal length you are shooting at, you will at times be able to make a wide-for-landscape-photography f/5.6 work for you. At other times, f/8 or even f/11 may be needed. As usual, the ISO setting should be selected to achieve the image brightness you want at the aperture and shutter speed you need. I experimented with Auto ISO on this flight, but was not always happy with the results. There was too much variation in subject brightness with shaded mountains being the biggest problem causation. I used manual settings most of the time. The focal length needed for aerial photography depends on your subject, but longer focal lengths are more difficult to shoot from a helicopter than wide angles. 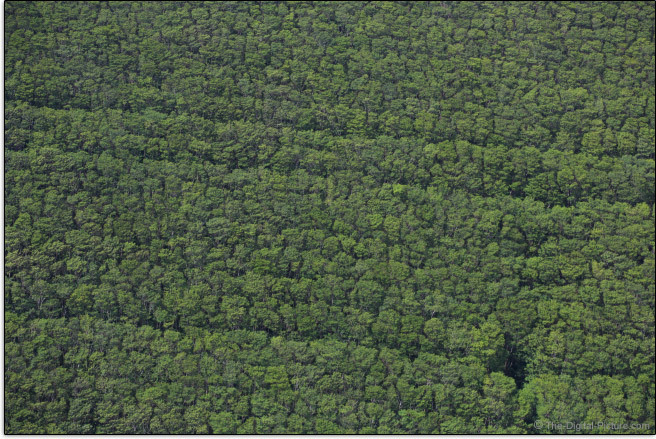 Conversely, a too-wide focal length will make it more difficult to keep parts of the helicopter out of the frame. A general purpose zoom lens is probably the best option for most aerial scenic photography - the full frame 24-70mm (or similar) equivalent angle of view. The farther you are from your subject, the more that haze destroys contrast. This also makes shooting wider angle focal lengths more favorable than telephoto focal lengths for the same desired framing - as long as the desired perspective remains. Have the pilot get closer. Your flight time of day matters. Know the best time of the day for sun direction on your subject and know the typical weather for that time of day. Also consider where the helicopter shadow will be at that time of the day. 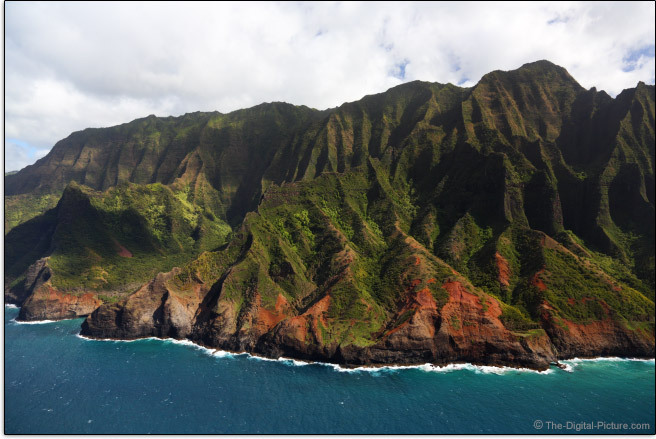 My mid-late afternoon departure time was ideal for the Na Pali Coast, resulting in some shadows in the cliffs but plenty of sunlight reaching the overall area. You (or if you are fortunate, your company) are paying a lot to be in the air. Shoot constantly - even when you have only one intended subject. Always be looking for images to be captured - especially be looking for patterns such as groves of trees, fields or anything else that catches your attention. Some of these subjects can yield nice bonus images from the flight. Do you get motion sick? While I have flown without such problems, I was starting to feel green/wrecked after continuously looking through a viewfinder from an unsteady platform for over an hour. Take preventative measures if you are so inclined. The overall physical exertion required by this flight should not be underestimated. Struggling against the wind alone can be exhausting. Would I take this flight again? Definitely. The rewards far exceed the physical and financial costs. Kauai's Na Pali Coast is spectacular.